As I drive to college in the early evening, I pass along the back side of our city’s airport, down a road that parallels the runways. Between the landing strip and the fence is a grassy meadow, home to training equipment for airport firefighters, a pile of broken concrete and twisted rebar. It’s also home to a group of rabbits who have made their warren in the shadow of the incoming planes. I have watched them now, for three springs, as I wait at the traffic light. They emerge from the rubble to nibble at wildflowers, chase their baby rabbits away from the pavement. And they race the planes. Under the shadow of everything from 747s to Cessnas, the rabbits run, blurs of fur as they speed alongside the runway. I don’t know if they think the planes are some kind of rabbit nightmare — giant mechanical hawks ready to pluck them from the grass , or if they just like to run. In three years, I’ve never seen those rabbits beat an airplane. But I dare any hawk to try and catch them. I think a lot about those rabbits these days, with just a few short weeks before graduation. I’ve been blessed in these years with my own planes to chase. Airplanes. That soared overhead and flew much higher and faster than I had my sights set on. I still don’t know about any of those ideas. Right now, I just want a chance — despite budget cuts and standardized tests and the pervasive policy silliness — to step into a classroom in the fall and be a teacher. But I do know this. I am stronger and better for the chase. I can read the inner thoughts of Manchitas the cat. Manchitas, she does not understand her owners. She finds them tiresome. This, I believe, is the cross-cultural world view of cats. Cats in California, cats in Canada, cats in Colombia… they would hold paws and sing Kumbayah about their shared superiority. However, they are too sophisticated for something so pedestrian. So they just glance knowingly at each other. “Los humanos son muy estupidos,” dice Manchitas. That is why I have dogs. We had cats for 18 years. They got on my nerves. 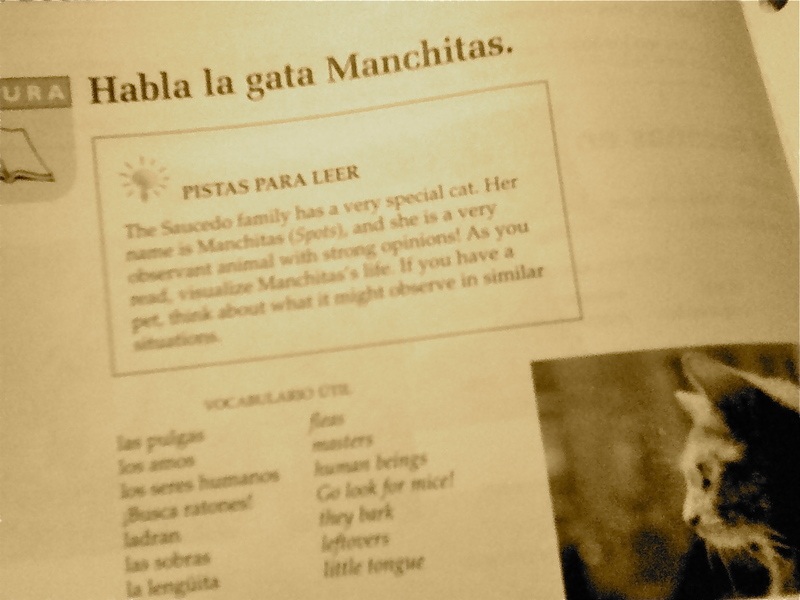 If my Spanish was good enough, I would explain this to Manchitas the cat. Alas, I fear my mangled Spanish would only fuel her documented belief that humans are inferior. So I will settle for reading her thoughts in Dos Mundos. Manchitas, by the way, no le gustan las pulgas. On this, Manchitas and I agree. And that is about what I can understand after 7 weeks of Spanish. Also, I know how to tell people I really like chocolate. Totally worth my tuition right there. My class ends in a week and then perhaps, I will begin blogging with more regularity. I know, you were wondering what happened and were just too polite to say so, all three of you still reading. So, as you may have gathered, I went back to college a couple of years ago to get a teaching degree. I know, imagine. All this excitement coming soon to a classroom near you. But although I had most of my core classes out of the way, glaring at me on the schedule was College Algebra. Now, I don’t have the “Math is Hard” Barbie. I did just fine in math in high school, liked it even, and in fact, did well enough on the SAT that for the liberal arts degree I was pursuing at the time, my math requirements were waived. First – BONUS points if you know where that headline comes from and don’t just think I’m gettin’ my hillbilly on. Second, when I’m neglecting this blog, it’s because I am furthering my education. And, believe it or not, I’m pursuing a teaching degree. I know, it’s hard to resolve that with the grammar horrors routinely committed here. Red lines and points off everywhere. Oh, I know, they’re not great works of literature. Plus, it’s so hipster to be anti-trend. Oh, the irony. If they were real, they'd be too hipster for "Twilight," too. You're *so* Bella. Ha! 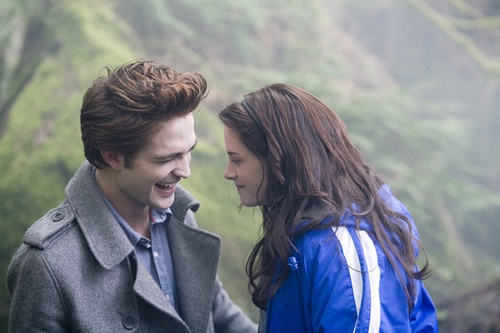 No doubt, the Twilight series offers plenty of silliness to fuel your disdain. Some of the dialog in that first movie? “Spider monkey?” Are you kidding me? “Team Edward” versus “Team Jacob.” I know, right? So dorky. When you have a middle-school daughter, you keep those tenuous lines of communication open by whatever means necessary. We talk about Edward’s stalker tendencies, whether Bella is really making wise choices, what it’s worth to give up for love, and what things of our selves we hold on to. And we also discuss whether Robert Pattinson or Taylor Lautner is hotter. Yeah, so? What are you going to do, take my Mother of the Year badge away? When my daughter was little, I was an expert on Junie B. Jones. Those aren’t great intellectual reads, either. But they were the kindling that fueled her love of books. With my son, it was the “Spiderwick Chronicles.” When he came to us, at 8, he announced he HATED reading. So we started reading out loud, books that captured the imagination of a second-grade boy. Now, he loves books so much, he marks on the calendar the day the next volume of the “39 Clues” series will come out. He starts wheedling for a trip to the bookstore as soon as we get within striking distance. And yes, I read those books, too. Because I want him to know what he values, I value. And because they know that, when I tell my kids, “try this book,” and hand them something a little meatier, they are more likely to trust me. So, hate away on the “Twilight” series. I would, but I’ll be too busy giggling conspiratorially with my daughter on the way to the movies. Also? Team Edward. Like there’s any contest. Oh “Hi!” Yes, I do have a blog. You like how I did that? Write every day in September, and then just stop for nine days? Here’s what happened. We went camping, and while we were gone, San Antonio had flooding, and lots of rain. And the storms blew shingles off our roof. And I mentioned lots of rain? It all came funneling in through the hole in the roof, which very squishy carpet in our daughter’s room. Also, pieces of the walls fell off. Which is not ideal. I think, not so much. I think domestic disasters are just God’s special way of telling me my blog was getting boring. So I will be filling you in on all those things as soon as I am able to laugh about it. Which, according to the information on my prescription vitamin bottles, should be in a week or two. In the meantime, my goodness, you have certainly come here looking for lots of important answers. Can I say “crap” in my school paper? Seriously, I cannot help the sock-sniffers, she-mullet searchers or those of you who have watched The Godfather too many times. But the school paper question, I am qualified to address. If you are in elementary school, you cannot say crap in your paper. Middle school, high school? Look, you probably can get away with it. But your teachers won’t be impressed, nor will they be shocked. Crap is a poser swear word. It is not creative. It lacks panache. Go to thesaurus.com and find something better. Try balderdash, claptrap, drivel, nonsense, idiocy, or even the vintage poppycock, and make a teacher smile. Real swear words, the ones with the punch you need, are off limits in an academic environment. Wait until you have a blog. Even then, you’ll want to use them sparingly for two reasons. First, saying them all the time becomes a schtick, and they lose impact. Second, and more importantly, your mom and dad and husband and minister and future bosses and maybe even your kids will end up reading your blog. And even if you’re 41 and totally confident in your belief that Jesus is worried about more important things than “bad words,” it’s just not worth the scatological excrement you’ll have to deal with. My all-time favorite email exchanges about the use of “colloquial language” took place with Blogger Roy Bragg . We were discussing what kind of things I needed to refrain from saying if I blogged for the San Antonio Express-News. Roy graciously gave me a very detailed list of what words I could and could not get away with on the paper’s website. It’s something I have kept in mind, but have not, as of yet, felt any need to reference. I have, however, blogged there today about President Barack Obama’s Nobel Prize Award. So, if you would like to read a post with a semi-coherent point, go there. Otherwise, I suspect you still haven’t found what you’re looking for. It’s that time of year again. The morning air begins to feel crisp with the coolness of fall. The lights of the football stadium shine like a beacon on Friday nights. Pumpkins start appearing on porches. And of course, one day, you open your child’s backpack, and there it is. The scheduled time for your parent-teacher conference. Oh, the excitement. Time to squeeze into tiny children’s desks, sit across from the smiling teacher. You know, the one who has secretly already judged your parenting skills? I’ve become somewhat of an expert in these, with one child completely through elementary school, and a second getting there. Oh please Lord, let him be getting there. Plus, in another year, I will be the one on the teacher side of the desk, and I’ve already had some of the top-secret teacher language classes. So here, in plain English, is a simple teacher-to-parent translator for some of the common things you might hear. 1. “Your child is certainly very high-spirited!” Your child behaves like a Chihuahua whose morning breakfast routine consists of drinking an entire case of Red Bull and then gobbling down a bowl of M&Ms. Seriously. I can’t mention ADD or medication, because that counts as a diagnosis and then the district would be on the hook for your kids’ treatment, but get some drugs. 2. “He/She does seem to have some focus problems.” Seriously. Ritalin, Concentra? Ever considered them? Can you sign this waiver saying it’s OK for me to duct tape your child to the chair? Please? 3. “Tell me about your morning routine at home.” Are you guys eating crack for breakfast or what? My initial thought was that your child was being raised by wolves, but now that I see you’re human, I’m guessing illegal drugs may be the issue. 5. “We are not teaching to the test.” Well, not the actual test, since the state testing board keeps those pretty secure. But we will be doing so many practice benchmarks that your child will go to sleep dreaming of filling in circles. When you go out for donuts, he will stuff his napkin in the center hole. 7. “Your child certainly has an advanced vocabulary.” Not all children can conjugate the F-word into all its various verb forms. The added use of non-verbal hand motions to make meaning clear is also impressive.